In November 2008 I jumped on the bandwagon and purchased a K3 (#02131) -- primarily to replace the IC-7000 that I had been using for contesting from my home station. However, use in only a few contests revealed the K3 to be a great radio. That was no surprise given all of the reviews and endorsements of the radio by top-notch DXers and contesters. So I decided I needed to make use of it to provide better ears in my mobile contesting activities. Although the K3 is relatively small and lightweight it's still a bit large for use from the front passenger seat which is where I like to do mobile contesting, and it doesn't come with a remote control head. The challenge was obvious: develop a module for the K3 that would integrate with CQ/X and would allow placement of the radio in the rear of the vehicle with full controllability from the operating position in the front. Review of the K3 programmer documentation revealed an extensive and well-documented list of functions that would, with a little programming, make the venture possible. I thought about what kind of user interface to devleop to make control from the "remote head" intuitive and easy to learn and the interface below quickly became the obvious choice. Button Controls: Each of the buttons performs the indicated function and the Tap/Hold feature is implemented with configurable hold time. In addition, the left/right mouse buttons can be used respectively for Tap/Hold. Frequency Entry: Clicking on the Freq Ent button opens an edit window on the VFOA part of the "LCD" display from which a frequency can be typed in. Frequency Tuning: Frequency tuning is currently performed with the cursor and page up/down keys. The tuning increment for the cursor keys is set using the radio buttons shown on the main tuning knob. The tuning increment for the page keys, which is intended for larger frequency changes including band changes, is set on the config page described below. I've obtained a Shuttle Pro 2 and will be experimenting with it as a tuning device and as a means of setting the rotary controls. 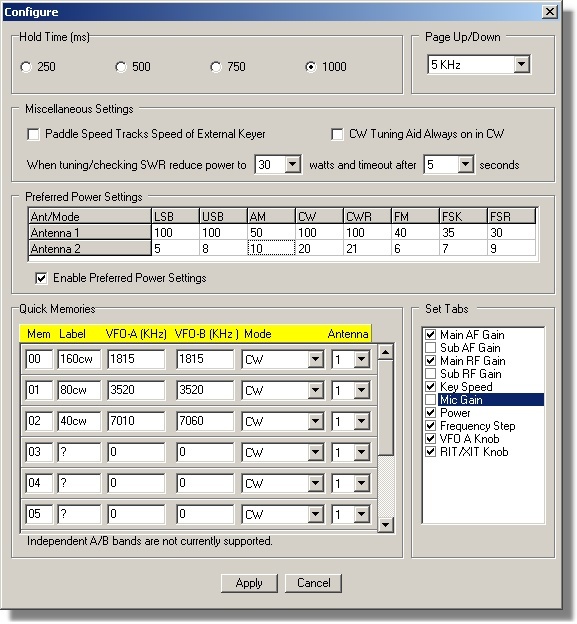 Rotary Controls: Rotary controls including AF Gain, Sub AF Gain, RF Gain, Sub RF Gain, Speed, PWR, etc are controlled using the cursor keys with the value read out in the small window shown on the control. Since some of these controls are more frequently used than others it may be desirable to access them using the Tab key rather than moving the mouse. Controls to include as tab stops and the tab order are specified in the Config dialog below. This Menu LCD layer is activated from the Menu button and allows choosing menu items from various categories and modifying those menu items. Clicking on the small question mark button brings up the user manual documentation for that menu item in a small window as shown above. The following LCD layer which shows installed options and firmware revisions, is accessed by clicking on the Info button. Clicking on the Power button will power down the radio but to make sure that this is the desired action the following "do you really want to do this" LCD layer is presented. 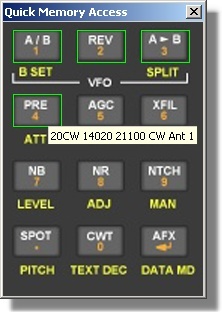 Configuration Button/Dialog: A small Config button, placed near the RIT/XIT area is used to access the Config Dialog below for setting parameters associated with the remote kit including: Hold time for discriminating between Tap and Hold presses of the buttons, Frequency increment for the page keys, Tab stops and Tab Order for the rotary controls, quick-memory parameters, and preferred power levels based on antenna selection and mode. Quick Memory Dialog: After the Quick Memories have been configured using the above dialog, clicking on the M->V button calls up the following dialog for choosing the memory. As shown in the screen shot below those quick memories that have been configured are highlighted. Hovering over each of them gives information on the associated quick memory. Clicking on the desired quick memory writes that information into the radio. SWR Button: The small SWR button, near the RIT/XIT area, is used to check the SWR at the antenna. Clicking on this button will put the antenna tuner into bypass mode, reduce power to a specified level, activate the tune button for a specified number of seconds, display the SWR on the button face, and then deactivate the tune button returning the power level and antenna tuner to their previous states. The power level and number of seconds associated with the SWR check are set in the Configuration Dialog above. 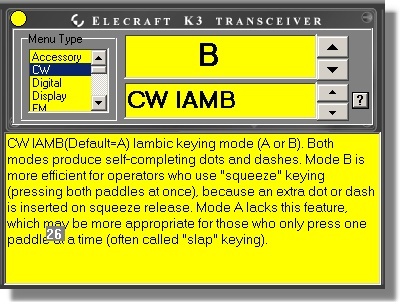 The full interface described above allows almost complete control and monitoring of the K3 but takes up a lot of screen real estate, especially when operating mobile on a laptop with its small screen, so beginning with Patch 177-05 the dialog below is provided as an alternate means of controlling and monitoring often used K3 parameters. Full button: The button labeled Full in the lower right hand corner is provided to facilitate access to the full interface described above. There is a similar button on the full interface that provides quick access to the small interface. SWR button: Click on this button to measure the SWR of the antenna at the current VFO-A frequency with the K3 antenna tuner removed from the path. The SWR will be displayed in the window normally reserved for the clock and when tuning is complete the clock window will revert to showing the selected time. Clock buttons: Use these radio buttons to select whether to show normal (UTC) time or the time remaining in the contest session. In order for the session time to be correct it must be set up in the main user interface using either the wizard or the menu item Display | Set Session Clock. Entry-less controls: Controls labeled PRE, ATT, NB, NR, AGC, M1, M2, M3, M4, Up, Dn, A<->B, A->B and CLR do not require entry of a value and are straightforward since they perform the same actions as on the full interface. Up(Dn) moves the band up(down) and A<->B exchanges VFOs A and B. For the on/off controls red indicates OFF and green indicates ON. For AGC there are three states: OFF (red), Slow (yellow), and Fast (green) and the button sequences between those states. Entry controls: The remaining controls A->, B->, RIT, AFG, RFG, XFIL, and SPD (speed) require entry of a numerical value. To save space a single shared slider is provided for inputting the values for each of these. Each control in this set consists of a button for assigning the slider to the control and an edit window in which to display the value of the controlled quantity. The cursor left and right keys can be used with the slider to make small incremental changes if it is not desired to use the mouse. Page up and down keys may be used with the slider to make larger incremental changes. Each control has page and cursor key increments appropriate to the quantity being adjusted. 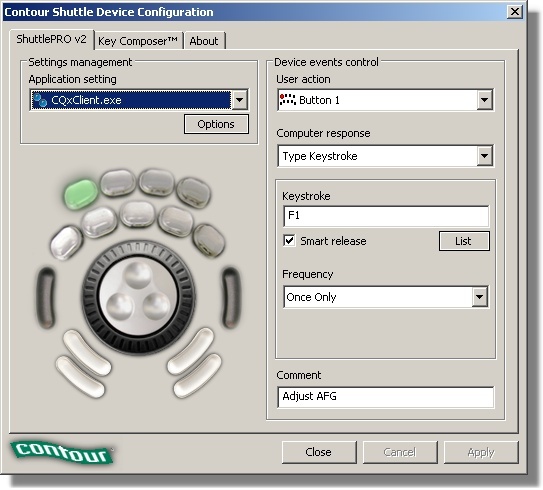 Using the above K3 Control Subset dialog and its associated function keys along with a Shuttle Pro 2 device enables the user to implement a multi-function remote tuning knob for the K3. 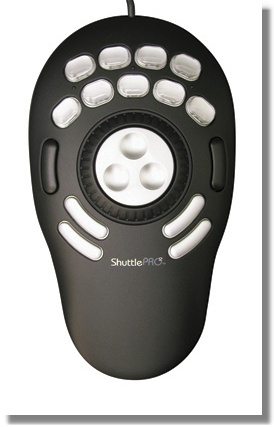 As shown in the image below the Shuttle Pro contains fifteen buttons, a wheel, and a shuttle each of which can be configured to perform a function in the focused window using the configuration dialog shown. Assignment of the buttons to CQ/X tasks is up to the user but for use with the K3 Control Subset buttons should be defined to have a Computer Response that mimics typing a given function key, and the wheel right/left should be defined as a repeating arrow left/right key. It is also useful to define one of the keys as a macro which mimics Alt+Tab -- I use the larger black button to the left of the wheel for this. Here's how it works with the main CQ/X window and the K3 Control Subset. With the focus on the main CQ/X window pressing the button defined as Alt+Tab places the focus on the K3 Control Subset. The gain is adjusted using the wheel. When the adjustment is complete pressing the button assigned to F1 terminates the adjustment. 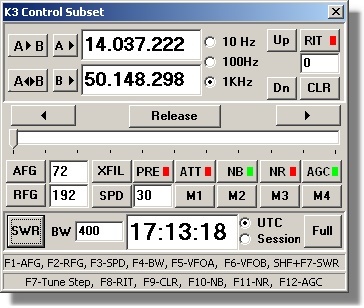 Pressing the button assigned to Alt+Tab moves the focus back to the main CQ/X window and moves the cursor focus to the QSO Entry window in use. With the focus back in the QSO Entry window the Shuttle Pro keys can now, if desired, be used for whatever task has been assigned to them in that window -- calling CQ, silently logging a QSO, etc. Note that the ability to use the Shuttle Pro requires that function keys have been defined on the K3 Control Subset dialog. This requires version 1.7.8 of CQ/X patched through Patch 178-06 which was made available in September, 2010. An intriging idea is to implement the above interface in a small (e.g. 7-8 inch) touch screen such as the ones made by Lilliput and Xenarc for use in automotive applications. If that works out you would have a full featured "K3 remote kit" a little smaller than the actual front panel. I haven't yet bit the bullet and bought one of these devices for testing the concept but if there are those that have access to one of these screens and would like to prove the concept please contact me at the address on the support page. In its current form use of the above interface in a logging program other than CQ/X would require some programming to interface to the DLL. However, I plan to create a version that is more easily interfaced using virtual serial port technology. It also would be interesting to network-enable the interface for true remote control across the internet. If you are interested in testing the K3 module you will need at least version 1.7.5 with all six patches applied or version 1.7.6 patched through Patch 176-03 but it would be best to download the latest version and it's associated patches in order to get all features including capability to use the Shuttle Pro. If you are not already a user of CQ/X you should also download the Quick Start Guide for Testing the K3.